I read a quote as a youngster which really shaped the way I considered things…. In fact whenever I feel fear creeping into my decision making process, I still remind myself of this quote. Man cannot discover new oceans until he has courage enough to lose sight of the shore. As a leader in my own right, I cannot recount to you the amount of times this quote has challenged me to move forward when all I wanted to was retreat into the known, into the safe. Moving forward presents a battle field for the psyche. There are unknown consequences, ones that are unintended and cannot be anticipated. There are new combatants and new challenges that will arise. And, perhaps most frighteningly, there is no way of completely retreating once the journey forward has begun… The leader who accepts this reality has no way of truly knowing what is in store for them. It is no surprise then, that the word ‘leadership’ evolved from the word ‘leith’ which roughly translates from ancient times into ‘he who goes forth to die.’ And while an ancient definition, this precisely exemplifies the issue facing many contemporary leaders as it draws the line in the sand between courageous leaders and leader-ish leaders. I illustrate the point that separates the good from the great with the metaphor of a moat. The point at which our decisions become courageous is the bright green stepping stone immediately before the ‘Vulnerability Moat’. Are we going to stay safe and dry and make choices that keep us on the side of the moat we know and are familiar with? This is the land of slow and incremental change. Or, are we going to dive into the vulnerability moat where we might sink or get swept away before we make it to other side? And who knows what is on the other side! People will ultimately view us differently. We will be raw and exposed, standing on the other side of the moat, dripping and tired. People will see that and judge that. They might not want to come with us. We might find ourselves standing there alone. Or worse, having to swim back to other side, with everyone knowing we just didn’t make it. Will they trust us again? Will I trust myself? 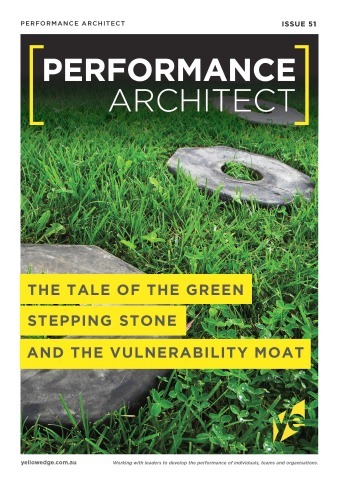 Most leader-ish leaders will pause on the Green Stepping Stone. They will survey the moat, get glimpses of what is on the other side and retreat, leaving what they could potentially achieve as an unrealized pebble, strewn on the ground. Another potentially courageous leader bites the dust and the status quo is maintained. However, the other kind of leader exists too. The one who surveys the moat, gets glimpses of what may lie on the other side and dives in anyway, acknowledging there are going to both intended and unintended consequences for their actions, yet they are driven to action by purpose and values. This is the action of the brave. On the other side of the moat, there lives transformational change and innovation of unknown scope. However, there also lives epic failures and the bones of leaders who felt the gripping cold of disappointment and instead of getting back and diving into a new moat, they let it overcome them and freeze their capacity to grow and move on. This is not the land of those who are afraid of being exposed, of making their failures and their successes public. This is the land, to borrow the words of Vulnerability expert Brene’ Brown, for those who are truly willing to get naked. Last year I stood on the precipice of the Green Stepping Stone, peering over the moat, trying to make a very major life decision… I was about the retreat when my Trusted Adviser (otherwise known as my very best friend), stood behind me with her two hands out. In one, she held a glass of wine (for the pain) and in the other, she held the strength of a gentle but firm push. “You know what you need to do,” she advised sagely. With those words I felt the gentle push of her hand between my shoulder blades. I took a deep breath, dove into the water and swam and paddled. The whole time I could hear her voice calling, “you go girl, swim, swim, swim!” Other voices began to join hers as I neared the shore. Voices of those who loved me and ‘had my back’. With the sounds of their love and support in my ears, I kept on paddling until my tired hands touched the other side. You see, as the prose by John Donne goes, no man is an island. When making big, courageous leaps, we need the unique fuel that comes from a close support network. Our purpose and dream will get us so far, and for the last few aching strokes, we need those we love. For an effervescent life, keep your thoughts fearless, your emotions constructive and your actions venturesome. Abby Rees is a Performance Architect at Yellow Edge (YE). YE Performance Architects is a company focused on developing high performance at individual, team and organisational levels.